The Viani Bar in Morlupo, just north of Rome, not only has wonderful breakfast pastries, great sandwiches and home-made ice cream. It also prides itself on always having fabulous decorations and edible gifts for every holiday. 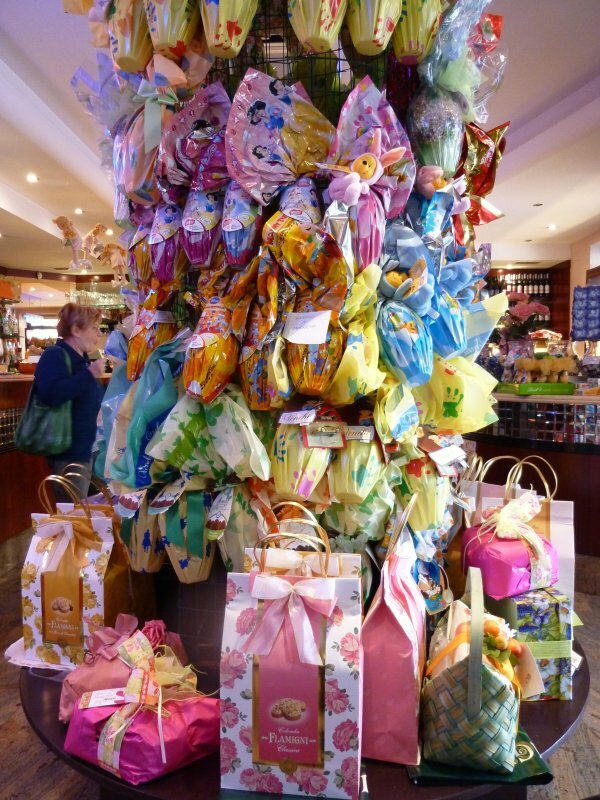 I had lunch there today and was mesmerized by the gorgeous Easter eggs and Colomba (traditional Italian Easter cake) they had on display. The Easter eggs are wrapped in colorful metallic wrapping paper. Each egg is filled with a surprise, usually a small toy, key chain or piece of jewelry. Some of the more expensive Easter eggs on sale contain more elaborate gifts. 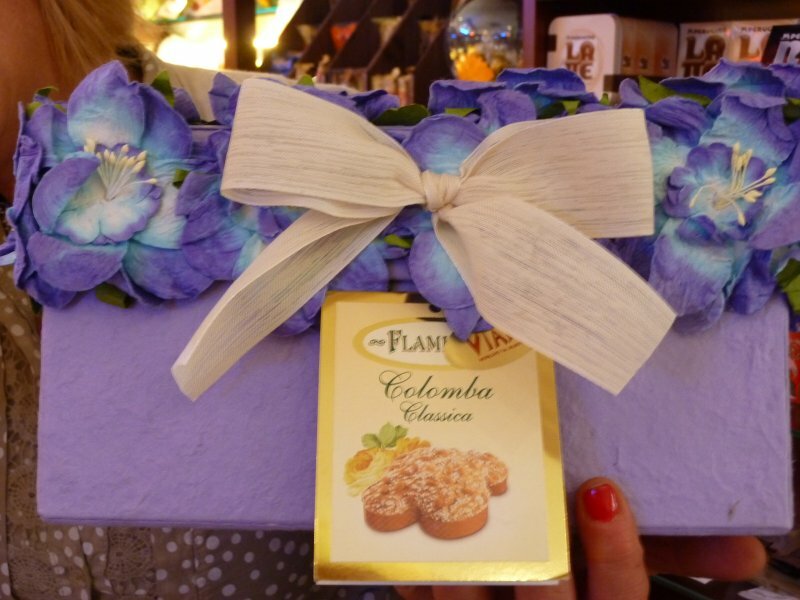 The nicest packages by far on sale at Viani are the Colomba. The traditional Easter Colomba, like the one below (the Colomba “classica”) is a sweet yeast bread filled with candied orange and topped with whole almonds and sugar. It’s beautifully packaged in a box covered with artificial flowers so pretty that they almost seem real. 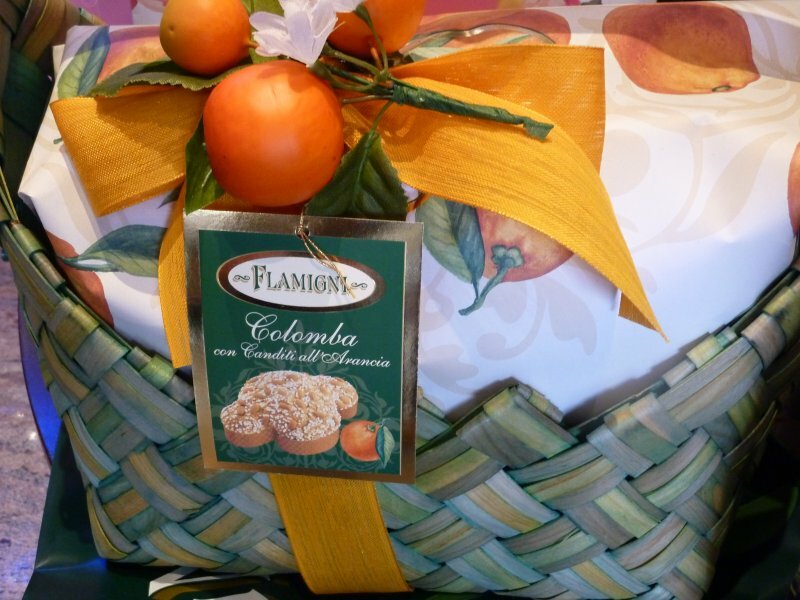 The pasticceria that produces this Colomba, and distributes throughout Italy, is Flamigni Pasticceria. The company is located in Forli’ in the Emilia Romagna region and has been owned and operated by the three Flamigni brothers since 1930. Another Colomba producer is Pasticceria Muzzi, located in Foligno. Muzzi is a much older company than Flamigni and dates back to the late 1700’s. These two beautifully packaged Colomba vary from the standard recipe: one is peach flavored and the other is filled with almonds. 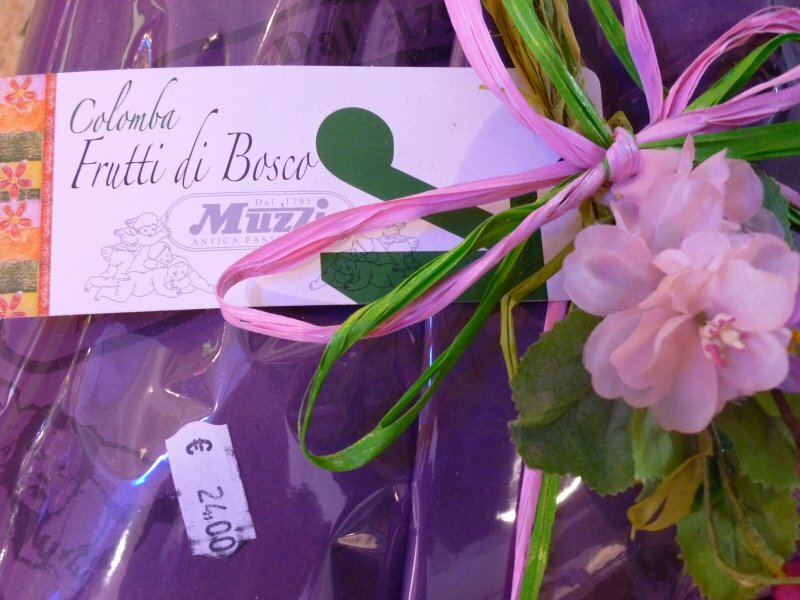 This Colomba, again featuring a beautiful artificial flower on a violet package with pink & green ribbon, is made with wild berries. The price for the Colomba is about four times what you would pay for a standard Colomba in an alimentari or grocery store. 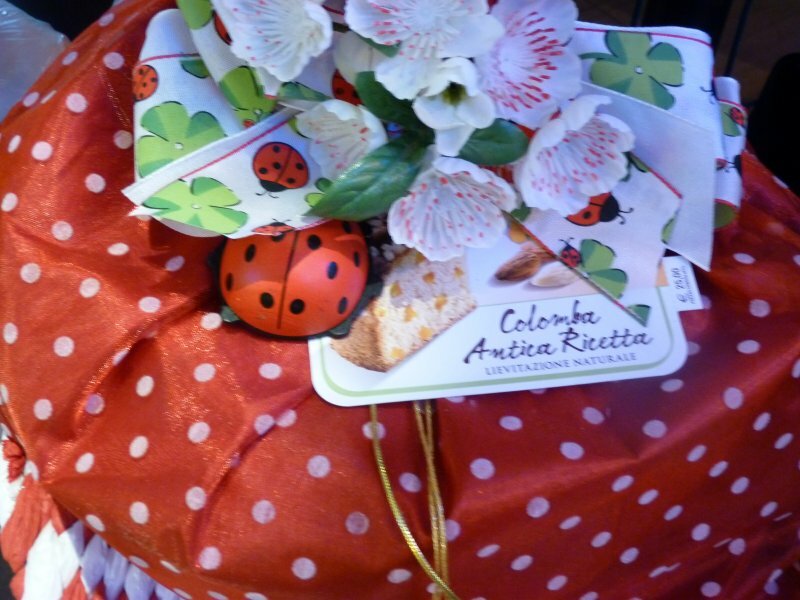 The price is for the lovely and unique packaging, but if you want to give someone a Colomba as a gift these are exquisite. My favorite is this ladybug package. I love the red and white polka dot paper, the wooden ladybug attached to the package, complemented by red and white flowers. I also like this Colomba in it’s pretty orange and brown basket with orange ribbon and decorated with artificial oranges. 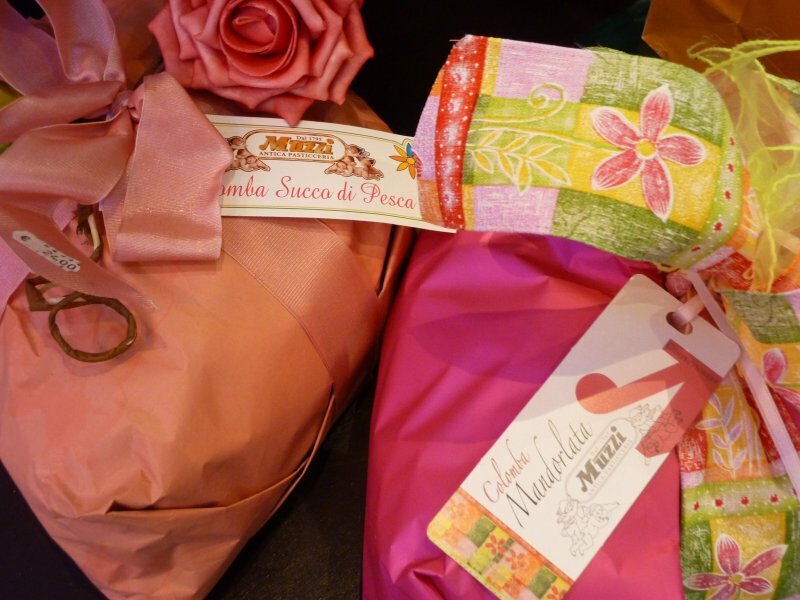 Almost every pasticceria in Italy produces Colomba at Easter-time and most have beautifully packaging. So if you will be an Easter lunch guest in an Italian home this is the perfect gift to bring!